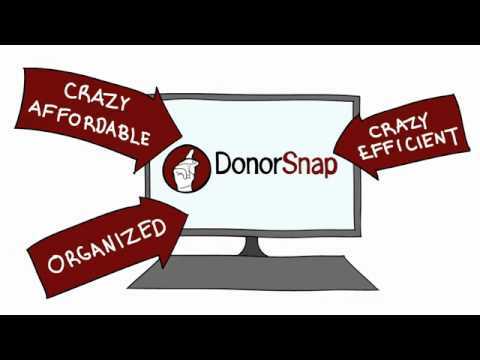 DonorSnap is an online software solution designed to deliver full feature donor management tools that are both simple and affordable for non-profit organizations. Monthly pricing, after a fixed setup fee, is staggered by contact quantity and every subscribed database enjoys every feature including unlimited users and training support. Powerful contact management capabilities crucially allow fundraisers to capture, organize and store donor contacts effectively. Build detailed donor records and customize databases with user-defined fields, merge contact duplicates while accommodating multiple addresses or multi-name households. Track contact relationships and affiliations, manage memberships and accept event registrations. DonorSnap includes built-in web development tools for authoring and editing web forms, all fully integrated to send registration information direct to the account database. Collect online credit/debit card and ACH/e-check donations without any additional PCI compliance fees or SSL security thanks to account support for goEmerchant. All forms are wholly customizable and can be created for any purpose such as newsletter signups or volunteer solicitation, while easily added to social media profiles such as Facebook. Acknowledge those signups or donations with batch letters and thank you emails, alongside versatile reporting tools and goal tracking to establish campaign performance. Additionally, DonorSnap’s centralized cloud-based access features an app dashboard view that can be quickly arranged and reordered using drag-and-drop. Each view can be used to relay specific data feeds and features according to the associated user account and color-coded to match desired branding. For optimized mobile access on iOS devices, DonorSnap for iPhone/iPad is also available for viewing contact lists, records, donation histories and adding notes on the fly. This is an excellent database platform. Not flashy, but very sufficient for our needs. This database does everything we need it to and more. We're a smaller non-profit with 1500 donors. The database makes searching for information and pulling reports simple while providing all the details we need. The BEST part of DonorSnap is their incredible customer support team. They've never taken more than a few minutes to respond to email questions with clear and concise answers. They answer in a way that not only gives you what you need, but teaches you how to find it next time. This team is really on top of their game. Our organization also just launched the new partnership DonorSnap has with goEmerchant for our online giving and feedback from our donors has been very positive. Nice to have it all in one system. This software is not flashy or polished. Then again it doesn't have a premium price tag. Once you learn the software though you'll find it has everything most people need to successfully manage an organizations donors/volunteers/etc. I think there are a few functions that would be great to add, but honestly, when I've asked the support team - 2/3 of the time they are already working on that next new feature! For example - one area that is lacking is regional donor search features. We have donors all across the country and when I go visit a certain area it would be great to search for all donors within 50 miles of a certain zip code for example. Thank you so much for the feedback. Regarding the proximity report... we actually have this ready to go on our testing site. It will go live in the next batch of updates. You'll see that option in DataMiner Platinum by adding the zip code field to the query builder. Let us know how it meets your needs! We were able to centralize all of our school's donation records. We can quickly and easily generate reports of all types - no limits on customizable reports. I can allow donors and alumni to update their own contact info. I can easily mass enter gifts and do mass uploads as well. It is a great system. I have worked with bigger and much more expensive databases at past jobs, and I always ran into problems that were unsolvable within the system - reports I needed that it couldn't generate, no ability to mass upload things, or something along those lines. Donorsnap has thought of EVERYTHING. And for such a minimal monthly price. I was recently at a fundraising professionals meeting, and someone in the forum asked what databases everyone used. A few people sheepishly said what they used, but both added "although I wouldn't recommend it. It's a pain." I was the only person in the room who proudly said "Well, I am using Donorsnap, which is really affordable and can do everything I need. I would highly recommend it to anyone." And a bunch of people jotted it down. Its hard to be happy with your donor database, but for the first time, I am. Their customer service is also great, and responds quickly to any questions. They have tons of video tutorials for every page, so you can learn how to do things when you need to handle a new process you haven't done before. I have worked with bigger and much more expensive databases at past jobs, and I always ran into problems that were unsolvable within the system - reports I needed that it couldn't generate, no ability to mass upload things, or something along those lines. Donorsnap has thought of EVERYTHING. And for such a minimal monthly price. I was recently at a fundraising professionals meeting, and someone in the forum asked what databases everyone used. A few people sheepishly said what they used, but both added "although I wouldn't recommend it. It's a pain." I was the only person in the room who proudly said "Well, I am using Donorsnap, which is really affordable and can do everything I need. I would highly recommend it to anyone." And a bunch of people jotted it down. Its hard to be happy with your donor database, but for the first time, I am. Their customer service is also great, and responds quickly to any questions. They have tons of video tutorials for every page, so you can learn how to do things when you need to handle a new process you haven't done before. Like all software, there is a learning curve. You have to figure out how to do the things you want to do - reports, imports, eforms, etc. One time, I had to import hundreds of gifts made on another platform, and get them to match up to the right donor records already in our database. It was quite the conversation with customer service as I learned how to do this, and it wasn't something I hope to have to do often. But it was possible to do it, without manually entering each gift! Which I can't say would be true for all databases. They have built in a ton of flexibility to this database. DonorSnap is a small company that gives big service! I really appreciate that I can ask for help and receive a response in a timely fashion (usually within just a couple of hours or sooner). One of the reasons we went with DonorSnap was because they offered a lot of what larger companies offered, but at far less the cost. While they didn't have all the bells and whistles, they didn't pretend to either. We needed something easy to operate. I love that the screens all work basically the same. You don't have to remember how things work from screen to screen. The reporting system encompasses every data field (theirs or our customized fields) and is a breeze to utilize. They advertised "no hidden costs" and after 3 years, that's still true. I've sat in on numerous free webinars that have all been timely within the fiscal year and presented in a concise manner. I like the 20 minute specific lesson experience led by knowledgeable instructors and also learn from questions asked by other attendees. But back to the bells and whistles. Throughout the short time that we've been with DonorSnap, they've thoughtfully added some popular features like credit card interface, the ability to quickly upload individual demographic info solicited from a form on our website, and mass email capabilities to save on postage. I know that there's a lot more to this product than I utilize, but I like that they give me the opportunity to check out new software features with their webinars. I can't think of any other company (that I initially considered) that didn't charge for every little features and support - whether I needed them or not! I'm very happy with DonorSnap! I wish there was a better way to show "InKind" donations on a report. Currently, they look the same as a cash donation. New to DonorSnap and feeling great! PLC gives DonorSnap an A+ - We love it! It is the perfect solution for a smaller land trust. Being online means my data is accessible when I am out on the road or working from home or a volunteer's office. I can update donor records quickly, from anywhere, and the program is so intuitive my staff and volunteers have picked it up very quickly with little anxiety. The support available via the page help and video help is extensive, in fact we haven't had to call DonorSnap yet, although during the conversion it was clear that the staff is friendly, accessible and efficient - so I wouldn't hesitate. After a very disappointing and frustrating experience with our previous software I am both relieved and pleased with all that DonorSnap brings to the table. Bravo! Smoothest conversion ever! I couldn't believe how seamless it was. And because I can define fields easily on the fly we didn't have to do a great deal of pre-work, as soon as we see a need I can simply create the field needed. DonorSnap is SO easy to use, very intuitive. With minimal training we are recording gifts, pulling mailing lists, tracking interactions and contacts, and syncing with Constant Contact. As a small regional land trust I love that my donor database is online. My board and committee members can enter data into member records themselves rather than sending me emails that I then enter. Their access is limited to what is appropriate for their role, but they can now look up contact information or document conversations - an efficiency that is so valuable when you have limited staff. I have found the reports to be easy to use, and have even created a few new ones - far easier than in ebase. Smoothest conversion ever! I couldn't believe how seamless it was. And because I can define fields easily on the fly we didn't have to do a great deal of pre-work, as soon as we see a need I can simply create the field needed. DonorSnap is SO easy to use, very intuitive. With minimal training we are recording gifts, pulling mailing lists, tracking interactions and contacts, and syncing with Constant Contact. As a small regional land trust I love that my donor database is online. My board and committee members can enter data into member records themselves rather than sending me emails that I then enter. Their access is limited to what is appropriate for their role, but they can now look up contact information or document conversations - an efficiency that is so valuable when you have limited staff. I have found the reports to be easy to use, and have even created a few new ones - far easier than in ebase. We migrated to DonorSnap over the summer from Ebase, and ran into trouble with the name override feature. DonorSnap is creating labels with two names "John Doe and Jane Doe" rather than John and Jane Doe. Perhaps there is an easy fix? I haven't asked yet. Beyond that, we are still learning to use Dataminer, but I find the page help feature a great guide. There were only one or two hiccups with the conversion, not in the migration, but because ebase and DonorSnap have different ways of tracking data (payment type, for example). Dennis suggested an easy work around, and within a year the problem will have dissolved on its own. Don't have any real cons yet...I'll keep looking! Great value! Gives us everything we need and more at a fraction of the cost of our previous system. We are a small non-profit that used to have a big donor software system. It was cumbersome--training new people always took some time. Reporting was confusing--we were never was sure that we were getting what we asked for. Support was adequate. The worst part is that the company seemed more concerned with selling add ons and upgrades than making sure we had what we needed. Moving to DonorSnap was such a relief! It is a lot more intuitive and easier to use. It has all the functionality we need and some to grow into. The support is very responsive but most of the time I can find what I need in the webinars and online videos that are available. I love the on-line responsive forms that keep donors on our website and the reporting that doesn't require me to write code. We are starting to take advantage of the prospecting aspects--tracking our donor contacts and using ticklers to make sure we follow-up in a timely manner. The mobile app is great for our Board members to have accessibility when they go out on donor visits. They can enter notes on their visit right on their phones! The Staff is wonderful--they want you to be successful. They have all come from the non-profit world so they understand your needs. The fact that it has all the functionality it does at such an affordable price is amazing. I have been recommending DonorSnap to the other Ed Foundations in our area. Ironically, the one thing that took me some time to adjust to was its flexibility. I was so used to having to work within the constraints of a system. I went from, "It doesn't work that way" to "Sure, you can do that!" I really appreciate all of the things I can do to customize DonorSnap to fit my needs. . . define user profiles individually, add and customize fields, rearrange my dashboard to view what I want to view. . . it has all been great. DonorSnap centralizes donation management capabilities with a full feature cloud-based system priced by size of contact database. Contact management includes record keeping, Excel data importing plus database querying and customization with user defined fields. Manage, track and accept donations securely while monitoring fundraising goals before sending acknowledgment letters or emails to contacts. Create and modify event registration, donation, membership or newsletter sign up forms using DonorSnap’s integrated web authoring tools. Integration with Keep&Share calendars, Quickbooks, and Constant Contact, plus data importing from Excel and a range of standard, rich reporting options. Customizable dashboard view enabling data and feature apps to be configured and color-coded based on user account preferences. Access DonorSnap from any internet-enabled device, plus a companion app for iOS devices adds contact viewing and note taking features. Below are some frequently asked questions for DonorSnap. Q. What type of pricing plans does DonorSnap offer? Q. Who are the typical users of DonorSnap? Q. What languages does DonorSnap support? Q. Does DonorSnap support mobile devices? Q. Does DonorSnap offer an API? No, DonorSnap does not have an API available. Q. What other apps does DonorSnap integrate with? Q. What level of support does DonorSnap offer? Q. Which apps is DonorSnap compared to most often?